Yes, it is me - honestly! 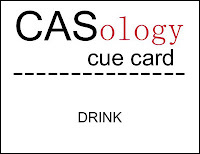 My cards are usually quite CAS. Sometimes ultra-CAS, especially when I only use half a sketch! And quite a few of you are in the midst of online CAS lessons (and producing some fabulous results), which I think I might go for next time. But deep inside of me, there's this mixed media person (I won't use the word artist) screaming to get out. Not loud enough, until now. 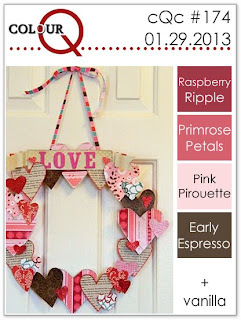 I love mixed media creations but don't do them because, well, what do you do with them afterwards? I've already got too much "stuff", and I don't like making things for the sake of making them if they're not useful afterwards (nowhere to put them). 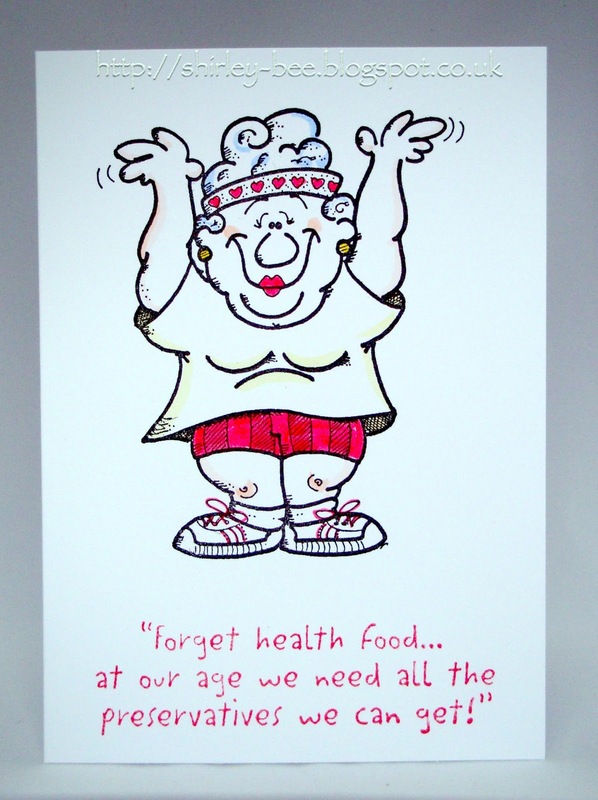 But if it's on a card, I can give it or sell it (easier than giving/selling an item that doesn't have a use). 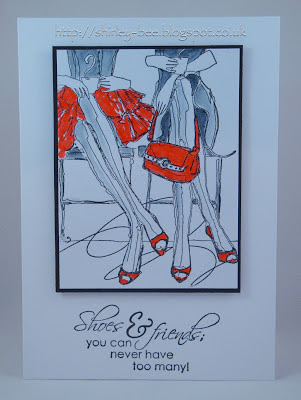 The inspiration for doing this card came from this month's Craft Stamper Magazine, which has a feature by Chris Dark, new to their design team. That's her card on the front cover. So I thought I'd use her technique of layering diecuts from watercolour paper onto a watercolour paper background to make a card for this week's MUSE, the inspiration card for which is from Suzanne Dahlberg. 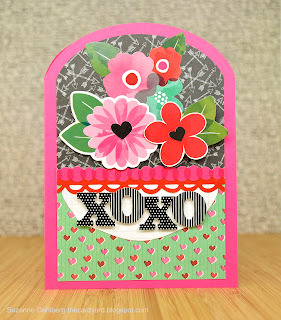 I used the pink, red and green colour scheme, the two flower types, the xoxo and the middle panel. 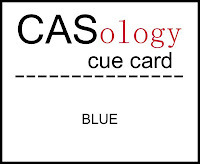 The base card has a two-tone red/green sheen to it. You can see the difference in the two large photos. Lots of gesso and acrylic paint in various shades, including gold. 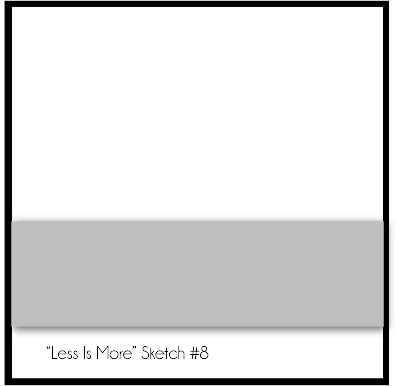 I had a blast making it, and pushing myself to add "more" instead of stopping at "less". Here are a couple of close-ups so you can see the texture. I'm also entering this into Simon Says Anything Goes. Almost everything went into this! So is it just a flash in the pan or will there be more of this? I think there'll be more, but not on a regular basis, as most of the challenges I enter are CAS! Ok. I'm not big into pink. I'm not big into hearts. And I'm obviously not big into paying attention. The challenge at Addicted to CAS is hearts. Tick. 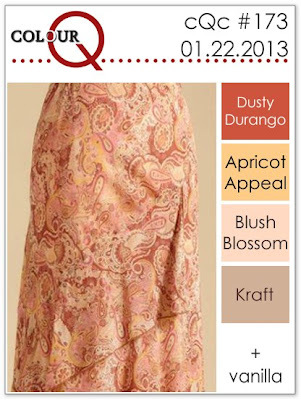 The challenge at ColourQ is pinks and brown. Tick. 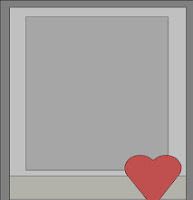 The guidance is: "You may flip or rotate the sketch and even replace the shapes. 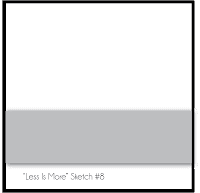 Please create with the sketch in mind." Out of sight, out of mind. Bit of a shock when I came to do the post. The heart was in my stash from a while ago. I'd made several out of a sheet of grungepaper covered in Fired Brick distress ink, then embossed through the Cuttlebug, then the raised area smeared with Versamark and heat embossed with clear powder, then cut out the heart shape freehand. Then I realised that if I stretched the sketch (again!) at CAS(E) This Sketch, I could enter it there too. Have I strayed too far, girls? And because I used a snippet of kraft card, I'm entering Pixie's Crafty Snippets for the first time. 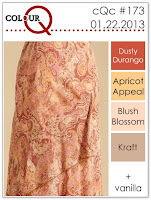 Paisley stamp by Stampendous, Happy Birthday by Paper Smooches, dots by De Nami. Use what you have in your stash, don't purchase anything new for your Muse cards. Explain your interpretation of the Muse inspiration card in your post and link back to Muse. 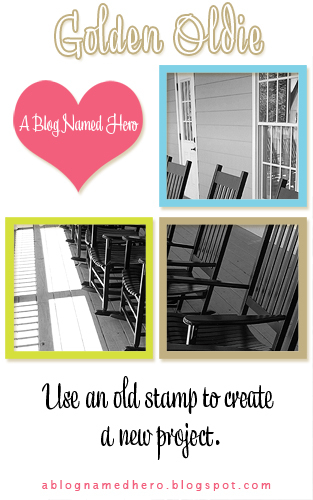 Vote for one of your fellow member's submissions that you find inspiring. And here's the inspiration card, provided this week by Amy Kolling. I took my inspiration from the yellow flower and the black sentiment. The challenge at CAS-ual Fridays is to use markers. Remember... a little can go a loooong way! You can color an image, or an element, or get creative and show us some fun techniques! 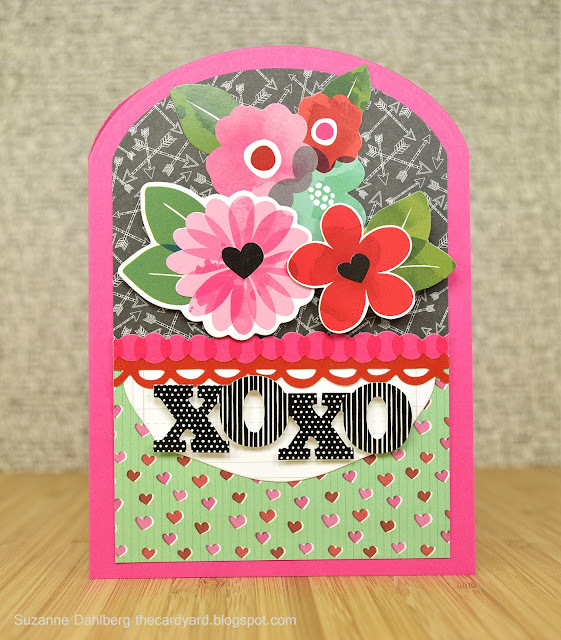 I used Tombow markers to colour the flower stamp then added doodling around the images, so that I could enter it into One Layer Wednesday, hosted this week by Karen from Snippets, to use doodling in your one layer card. You can see from these two close-ups where I've started doodling, and the finished panel. 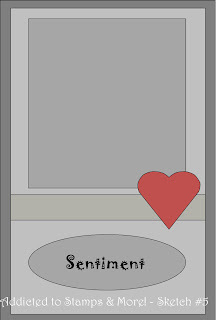 I stamped the sentiment then added some doodled lines to define the panel. Oh, and a bit of Stickles for the flower centres. 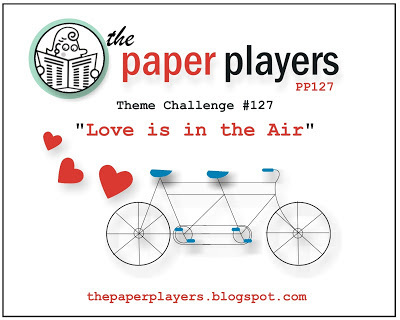 And this week's challenge at Simon Says is paper piecing. The bottle is stamped directly onto the white card, pieced with green paper, then pieced again with white for the label. 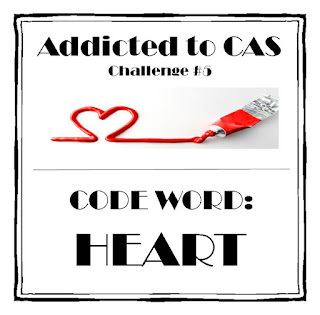 And their big sister, Addicted to Stamps and More, is having a CAS party this week. And at Hero Arts, this month's challenge is try something new. Well I don't think I've ever die-cut vellum before. Hero Arts F4136 Assorted Dot Border, sentiment from CL646 Happy Birthday. 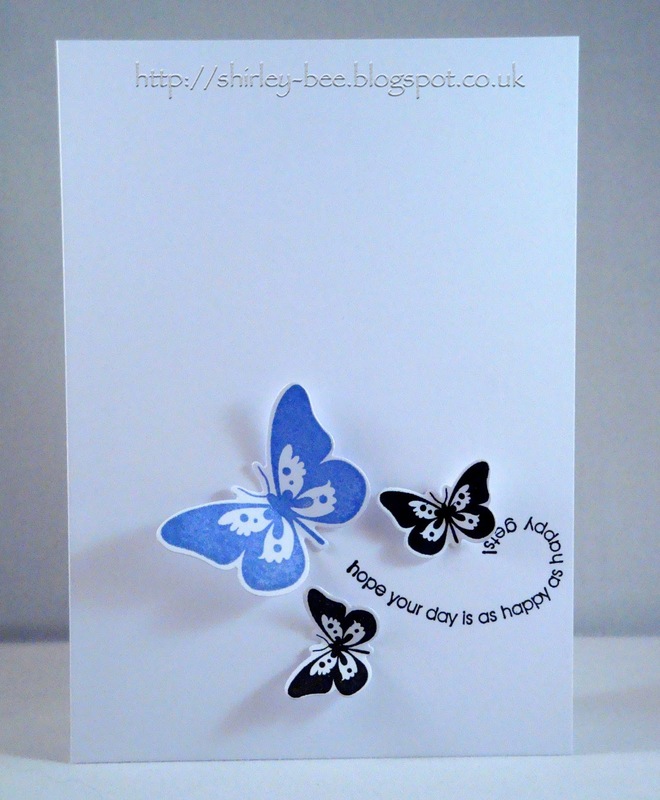 Butterfly die-cuts from Clearly Besotted. 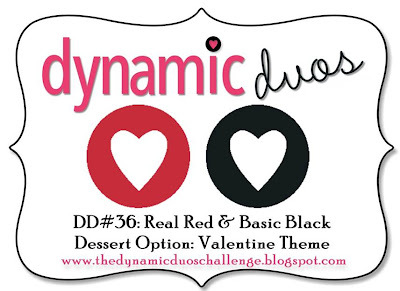 I'd already made a card for Dynamic Duos but this one ended up with a red and black colour scheme so in it goes. 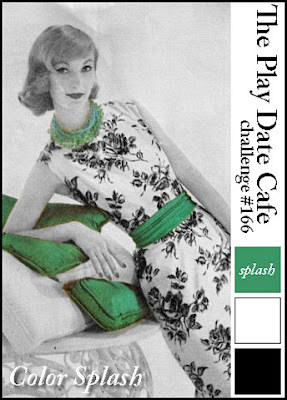 This week's Simon Says challenge is USE WASHI TAPE. There's just one strip of washi tape on the card - the red stripe. Everything else is stamps from Urban Life and Urban Beats, both by Sam Poole for Creative Expressions. I like these two sets of stamps, as they're ideal for teenage/young male birthdays. I'm fashionable again! Well my stamp is - I've always been fashionable - after a fashion ;) I've had this jar stamp for years, and it seems that jars are very on trend this year. The jar is from Inkadinkado stamped in Versafine Smokey Gray then covered in Glossy Accents, the flowers are from Hero Arts 657776, and the sentiment is from Hero Arts CL139 Birthday Messages. And Whoosh, it's Anniversary time! The blogvine has been busy, and surreptitious emails have been flying around the world, so that we could get together and wish our dear blogfriend Darnell and Mister Hunk Kevin a very happy 43rd wedding anniversary. Darnell has been sharing photos of herself and Mister in their younger married days (they didn't look old enough to be married! ), and Ardyth had a little ruse going with Darnell that they would set up a wedding photo post. Well, that's what Darnell thought. In the meantime, Ardyth sent word out for followers and friends of Darnell to post an anniversary card. If we didn't manage to contact you, please don't feel left out, it's just that not everybody's email address is public and, of course, we couldn't go public on this. But please join in the fun and link up at Ardyth's blog. If you're not a follower of Darnell, you're missing a treat as she regales us with her exploits in her own special way (and special language!). She has us crying and laughing, usually in the same post. Husbands and other family members wonder why we start to sniffle while we're on our computers or tablets, then suddenly snort (I misspelled that as snot - but quite often that's the case too) with laughter. And today's post is no exception. Have a look at Mister's shirt. So, Darnell and Kevin, Happy 43rd Anniversary! Enjoy your day. No, SERIOUSLY, enjoy your day! And I'll raise a glass to you both. It's only half past twelve here, but it's five o'clock somewhere! I forgot to link one of my cards to Simon Says challenge of Black, White and a splash of colour. So I made another card (any excuse). The butterflies are from Clearly Besotted, with the newly released matching dies, and the curly wurly sentiment is from Stampin Up. 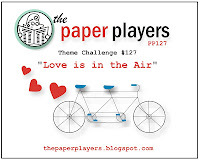 The challenge at The Paper Players is to make a romantic card. What's more romantic than an engagement? 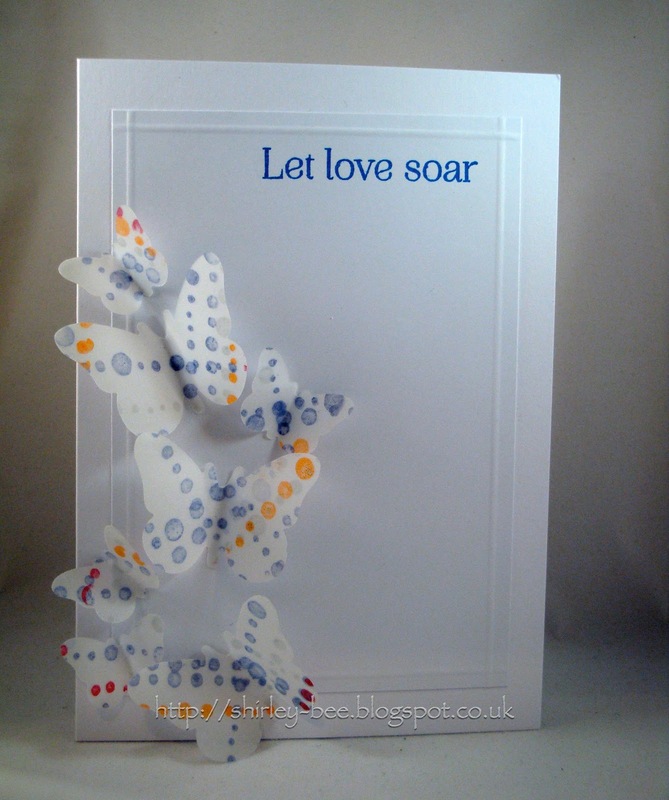 The hearts are from Printworks Q012 Always & Forever, stamped in Brilliance Pearlescent Orchid, and the sentiment is from Clearly Besotted.